This week, an unprecedented wave of popular protests forced Blaise Compaoré to step aside as president of Burkina Faso, twenty seven years after the military coup that brought him to power. Amber Murrey reports. An incredible political transformation has been taking shape in the ‘Land of the Upright or Incorruptible People’, Burkina Faso. Twenty-seven years after the assassination of revolutionary leader Thomas Sankara, Burkinabés turned out in their hundreds of thousands, for several days of protest, chanting “trop c’est trop” (“enough is enough”), echoing in the process a long history of trade union activism against political repression in the country, as well as protests staged through the Balai Citoyen collective. After four days of the popular anger, President Blaise Compaoré vacated his post. The protesters had gathered to voice their opposition to an impending parliamentary vote, scheduled for Thursday, 30 October 2014, which sought to alter the constitution so as to extend electoral limits by an additional three terms. The amendment would have allowed Compaoré to run in the upcoming presidential elections – at the time set for 2015. People turned out en mass against the vote on Tuesday, with an estimated one million people marching, mostly peacefully, on Sankara’s Place de la Revolution, so-named for the important role of the square during Sankara’s presidency – it was later given the more placid name ‘Place de la Nation’ by Compaoré, an attempt at symbolic erasure of Sankara amid the imposed silence regarding his role in Burkina’s history (powerfully evoked in a song by Samsk le Jah). Thomas Sankara had led the country in a grand social project of environmental, gender and political-economic empowerment from 1983 to 1987. His leadership ended following his assassination in a French-backed coup d’état, culminating in his former second-in-command, Compaoré, seizing power. Last Thursday, 30 October, riot police fired bullets and tear-gas canisters into the assembled crowds. The major opposition party, the Movement of People for Progress, reported that 30 people were killed and more than 100 wounded. The Burkinabé military—which is supported and partially funded by military-to-military and anti-terrorist monies from the United States—was deployed to occupy the streets and subdue the peoples of Ouagadougou on Thursday. Sister protests were held outside the embassy in Paris. In this context, protests turned increasingly aggressive, reflecting people’s cumulative determination to effect change at great personal and physical cost as well as risk (as evidenced in numerous powerful reflections from protesters on-the-ground). Angered by both (i) the militarised response to their demands and (ii) Compaoré’s seemingly blasé reaction to the protests – insisting he would cancel the parliamentary vote but remain in power until the elections could be arranged – people remained on the streets for four days. Protesters took the state television and broadcast centre headquarters and burned debris outside the homes of political leaders, including that of Francois Compaoré, the President’s brother. The airport was closed down and protests culminated in the burning of the Parliamentary building. On Friday, 31st October at around 8pm, protesters marched to the Armed Forces Headquarters in Ouaga’s centreville, demanding that military leaders – in particular the retired general Kouame Lougue – stand with them, or against them. 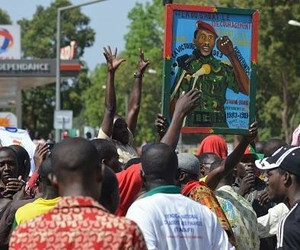 At the same time, another group of protesters demand that the Presidential Guard, Lieutenant Colonel Isaac Zida join protesters as a possible leader. Rumours abounded on Thursday that Compaoré, after 27 years as President, had fled the country. These calls were premature; but on Friday, 31 October 2014, he announced that he was, indeed, vacating his post. The banners, language and symbols employed indicated a solemn determination. Women marched with long wooden pilons (pestle-spoons used for pounding and turning food). One slogan, ‘Shoot [me]! Liberty or Death!’ evoked recent demonstrations in Ferguson, Missouri and elsewhere in the US. What has since become the #BlackLifeMatters movement drew upon the final words— ‘Hands up, don’t shoot!’— of an unarmed Michael Brown, who was shot and killed by a police officer while surrendering, as a means of speaking against racialised police violence in the US. 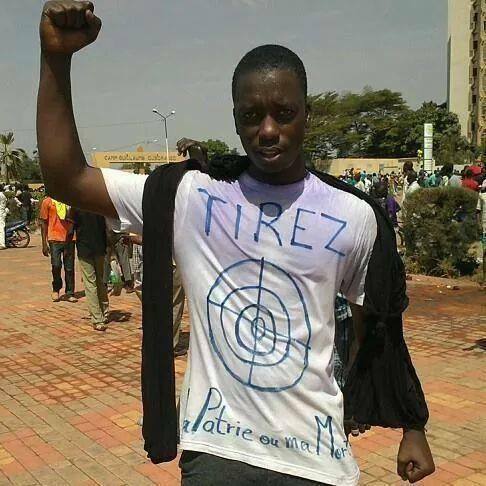 In a further iteration of anger against racialised and militarized power, the young man (pictured to the right) has drawn a bull’s-eye on his white t-shirt; “Tirez!” (‘Shoot [me]!’) the slogan challenges; beneath it another one, ‘la patrie où la mort, nous vaincrons’ is in blue beneath the bull’s-eye, building energy from Sankara’s popularised revolutionary idiom. Drawing on the historical legacy of Sankara, protesters wore shirts bearing his image and held plaques etched with his words. Signs read, ‘Blaise à bas’ (“Down with Blaise”) and ‘Blaise dégage!’ (“get out, Blaise”). Compaoré’s persistence in power was a testament to the injustice of a global system that values ‘security’ for capitalism over democracy for the people. Indeed, speculations on the potential jeopardizing of US anti-terrorism efforts through Compaoré’s withdrawal emerged on the very day of his announcement to step aside. Compaoré has been a long-time military partner of both France and the US. The US military operates drones and spy planes from their air detachment stationed in Ouagadougou and Burkina is a historic member in the US’s Trans-Saharan Counter-terrorism Initiative (TSCTI), which involves military expansion and training in the region in the name of anti-terrorism, namely the threat posed by Al Qaeda (read Dr. Jeremy Keenan’s work on the possible fabrications and exaggerations of ‘terrorist threats’ in the Sahel as a means of obtaining military assistance from the US). In this context, Compaoré’s departure is an immensely empowering moment, no matter what happens in the next months (read the open letter from Mariam Sankara, Sankara’s widow, to the people of Burkina Faso here). Indeed, a plethora of speculative analyses on the ‘uncertain’ future have been quick to emerge from pundits, journalists and commentators. For the country’s economic and political elites, the political transformation brought about by Compaoré’s departure is ‘manageable’ as long as the political and economic structures of Burkina remain unchanged. Meanwhile, international commentaries on the Burkinabé protests immediately drew upon a discourse of ‘uncertainty’ in post-revolutionary moments. In the shadow of post-Arab Spring disappointments in Egypt, people have rushed to consider, ‘Will this revolution be just like Egypt?’ or to posit that‘Unfortunately, this will probably be business as usual’. This fatalistic discourse fails to appreciate the enormous energy required by people to rise up against 27-years of presidential power—indeed, the energy required by people to rise up. Period. As this article goes to press, Radio Omega FM Ouaga reports that a meeting between military officers, opposition party representatives and civil society leaders was held on 2 November 2014 on the subject of managing the power vacuum and ensuring that the moment of political transformation is managed for with the interests of the people in mind. This meeting comes after protesters took to the streets again on Sunday, demanding that the military not co-opt the movement. Of course, we should learn from the political situation in post-Arab Spring Egypt. 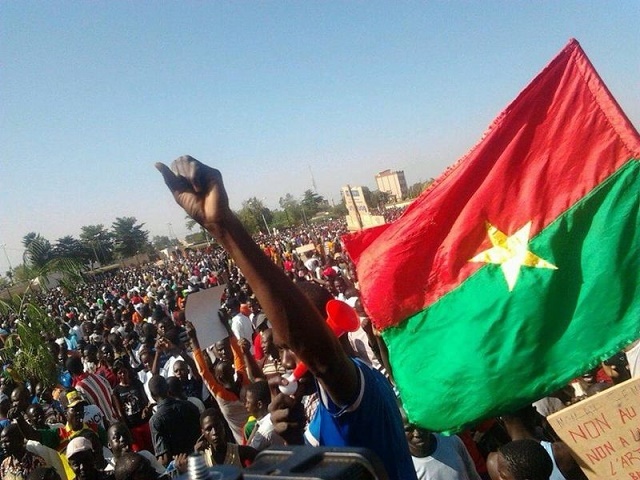 However, to immediately and reflexively raise doubts over whether this revolutionary moment will bring about serious political, economic or social empowerment for the people of Burkina pays a disservice—even if inadvertently so—to the protest movement as well as to the transformative potential it represents. Such a response from the ‘international’ media echoes the discouraging calls frequently emanating from the dominant medias of autocratic regimes that make the case for why people should not rise up against their leaders. In this framework: ‘Look what happened to Egypt’ could become a refrain deployed to suppress future movements across the continent. When, in fact, the popular uprisings in Tunisia and Egypt continue to inspire and motivate resistance movements precisely because they show that we can say no: “Si c’est chaud où pas, on peut dire non! “For example, a million people took to the streets in Cotonou, Benin on 30 November 2014, demanding municipal elections. Let us celebrate this moment and look with both an optimistic anticipation fed by this recent victory as well as a critical eye for the ways in which political mobilizations in the past have been sabotaged—not because sabotage is inevitable in Burkina today but precisely because it is preventable.